1. The volume of a cube is numerically equal to its surface area. What are the dimensions of the cube? 2. 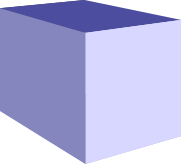 The volume of a cuboid is numerically equal to its surface area. The lengths of each of the edges are integers. What are the dimensions of the cuboid? The cube has sides of length 6 units.